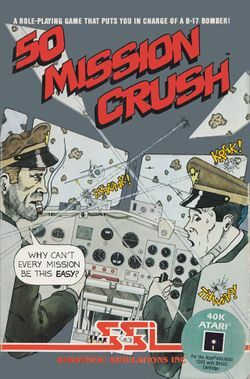 50 Mission Crush (sometimes written "Fifty Mission Crush") is a turn-based strategy game published in 1984 by Strategic Simulations, Inc. (SSI) that simulates the career of the crew of a B-17 Flying Fortress bomber during World War II. The bomber is based out of the RAF Thurleigh base just north of London, and is part of the 8th Air Force. While most of SSI's games emphasized long-term strategic planning, 50 Mission Crush was marketed explicitly for its quick, comparatively fast pace: each mission takes no more than about 10 minutes. SSI described it as a "role-playing game". Atari 8-bit box, back side. This page was last edited on 20 June 2012, at 06:27.